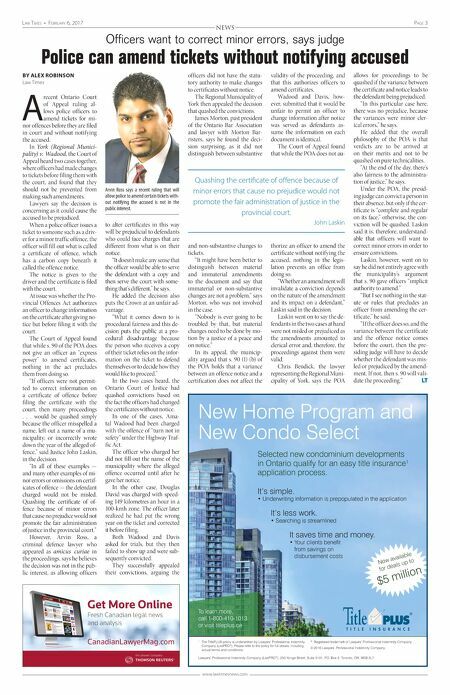 Page 2 February 6, 2017 • Law Times www.lawtimesnews.com not discuss any Ontario-AIG matters with anyone at the firm, and he would even have a work space several offices away from those working on the matter. "While technology, such as e-mail, might serve to diminish face-to-face interaction, the po- tential for inadvertent disclosure is significant," said Court of Ap- peal Justice Sarah Pepall in the decision. "Indeed, LBM recognized the potential for such disclosure by imposing a safeguard that Foulds' office would be located several offices away from those LBM personnel working on Ontario-AIG matters. However, this precaution does little to ad- dress Foulds' actual working re- lationship with McInnis." The provincial government brought a cross motion seeking an order that Lloyd Burns McIn- nis be blocked from representing AIG, arguing that not every conf lict of interest can be met by following law society guidelines. The application judge sided with AIG, but the Divisional Court then overturned that decision. The Court of Appeal found that the possibility that confi- dential information could be disclosed trumped the fact that the firm had followed all Law Society of Upper Canada guide- lines concerning conf licts of interest. There was no suggestion that any impropriety had taken place on Foulds' part, but the court found that the firm's compli- ance with the guidelines was not enough to rebut the presumption that confidential information could be inadvertently disclosed. In 1990, the Supreme Court of Canada set out the require- ments for removal in MacDon- ald Estate v. Martin and invited law societies and the Canadian Bar Association to come up with judge's language in one of the jury questions, saying he failed to use the "but for" test that was agreed on. In the proceedings, Gans approved two questions for the jury, which were whether each appellant had breached the standard of care, and if they had, whether that breach was "a cause" of Surujdeo's death. The appellants submitted that this was not the "but for" causation test, agreed on by the parties, and that the injection of "a cause" ran afoul of the re- quirements of the appropriate test. The court found that while Gans had used the incorrect wording in the question, "the trial judge's error in respect of the jury question language does not necessitate a new trial." The doctors argued Gans had also erred by refusing to poll the jury at their request after the ver- dict was announced. The appellants hoped to poll the jury on how they came to their decisions, but the judge re- jected the request. The doctors argued the judge erred in concluding he lacked the jurisprudence to poll the jury. The Court of Appeal found that the judge has the jurisdic- tion to poll the jury when war- ranted, but that his refusal to do so for the reason proposed by the appellants was correct "be- cause the appellants sought to poll the jury for an impermis- sible purpose." The court said that the appel- lants' purpose to have the jury polled was to ensure that five jurors agreed on the particulars of their decisions. Brown said jurors are able to arrive at an answer "by different evidentiary routes." Christopher Hubbard, who is acting for the doctors, declined to comment. LT NEWS guidelines concerning conf licts of interests. But the law society's com- mentary on the Rules of Pro- fessional Conduct acknowledge that following the guidelines that were developed may not be adequate in every case to prevent disqualification. Gavin MacKenzie says this is the first decision since Mac- Donald Estate in which a Can- adian court has disqualified a law firm from acting on a case despite having set up a compre- hensive ethical screen in a timely manner. As Foulds and McInnes worked together at least 50 per cent of the time, the decision raises the question of what the threshold is for how closely two lawyers can work together with- out being at risk of disqualifica- tion, says Gavin MacKenzie. Brooke MacKenzie says firms need to take note of the potential implications of the decision. "Because even for large firms that have smaller practice groups or lawyers with regular com- munication with each other or a working relationship on multiple files, existing and future screens might not hold up to judicial scrutiny on a disqualification motion, if screened lawyers have a continuing working relation- ship with lawyers on the other side of the wall, because we don't exactly know what that thresh- old of an extensive working rela- tionship is such that the wall may be insufficient," she says. A spokeswoman for the Min- istry of the Attorney General said the decision is consistent with the government's position before the court ruled, but she declined to comment further, as it's still within the appeal period. LT Continued from page 1 Judge says 'potential for inadvertent disclosure' exists No basis to overturn verdict Continued from page 1 NOMINATIONS NOW OPEN! The Canadian Lawyer InHouse Innovatio Awards is the preeminent award program recognizing innovation by members of the in-house bar within the Canadian legal market. These awards celebrate in-house counsel, both individuals and teams, who show leadership by becoming more efficient, innovative and creative in meeting the needs of their organizations. 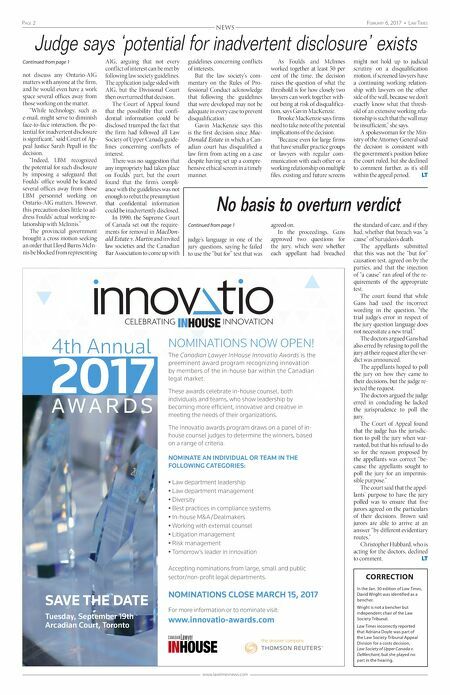 The Innovatio awards program draws on a panel of in- house counsel judges to determine the winners, based on a range of criteria. NOMINATE AN INDIVIDUAL OR TEAM IN THE FOLLOWING CATEGORIES: • Law department leadership • Law department management • Diversity • Best practices in compliance systems • In-house M&A/Dealmakers • Working with external counsel • Litigation management • Risk management • Tomorrow's leader in innovation Accepting nominations from large, small and public sector/non-profit legal departments. NOMINATIONS CLOSE MARCH 15, 2017 For more information or to nominate visit: www.innovatio-awards.com 2017 A W A R D S 4th Annual SAVE THE DATE Tuesday, September 19th Arcadian Court, Toronto Untitled-2 1 2017-02-01 9:45 AM CORRECTION In the Jan. 30 edition of Law Times, David Wright was identified as a bencher. Wright is not a bencher but independent chair of the Law Society Tribunal. Law Times incorrectly reported that Adriana Doyle was part of the Law Society Tribunal Appeal Division for a costs decision, Law Society of Upper Canada v. DeMerchant, but she played no part in the hearing.